As the Ducati Monster 821 completes a year in India, its maker is offering a Termignoni exhaust system and Ducati Quick Shift as complimentary fitment with the purchase of a new motorcycle, but only for a limited period. The Monster 797+ will also be offered with a Termignoni exhaust at no additional costs. 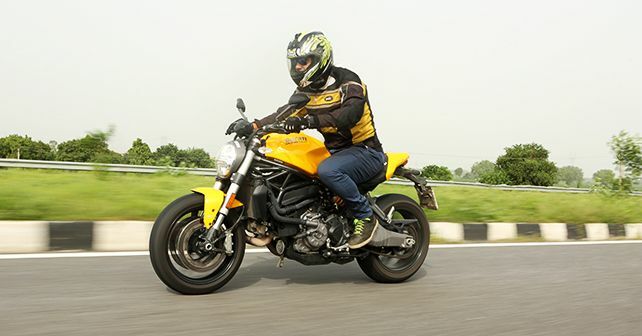 It’s been a year since Ducati launched the Monster 821 in India. And in just a year, the company has sold over 100 units of the motorcycle in India. Now, to celebrate the Monster 821’s first anniversary as well as its sales success, Ducati India has announced that they’ll offer Termignoni exhaust and Ducati Quick Shift (DQS) as complimentary fitment on the purchase of a Monster 821. The offer will be valid from 1st April – 30th April 2019. Interestingly, customers planning to buy the more affordable Monster 797+ will also benefit from this offer, as they will also get a Termignoni exhaust for their bike at no additional cost. While Ducati hasn’t divulged any technical details of the Termignoni exhaust, we believe it’s a slip-on carbon-fibre unit, and it costs around Rs 1.43 lakh. As for the performance improvements, it reportedly brings a torque gain of 3 per cent. At medium revs, the Termignoni also helps extract 7 per cent more torque and power. In case you need reminding, the Monster 821 is powered by an 821cc L-Twin motor that churns out 108bhp and 86Nm of torque. The engine comes paired to a six-speed transmission. However, with DQS on offer, you won’t have to use the clutch to shift gears. The offers on the Ducati Monster 821 definitely look like a great value but don’t forget that its prices were hiked recently. The 821 was launched in 2018 with a price-tag of Rs 9.51 lakh (ex-showroom), while it now retails at Rs 10.99 lakh (ex-showroom). Its competition in India includes the likes of the Triumph Street Triple, Suzuki GSX-S750 and Kawasaki Z900. MotoGP 2019: Has anything changed at all?